Annite: Mineral information, data and localities. Originally named in 1868 by James Dwight Dana for a ferrian mica, but redefined as a ferroan mica by Alexander N. Winchell in 1925. Both authors named a mineral after the same locality at Rockport, Cape Ann, Essex Co., Massachusetts, USA. Mica Group. 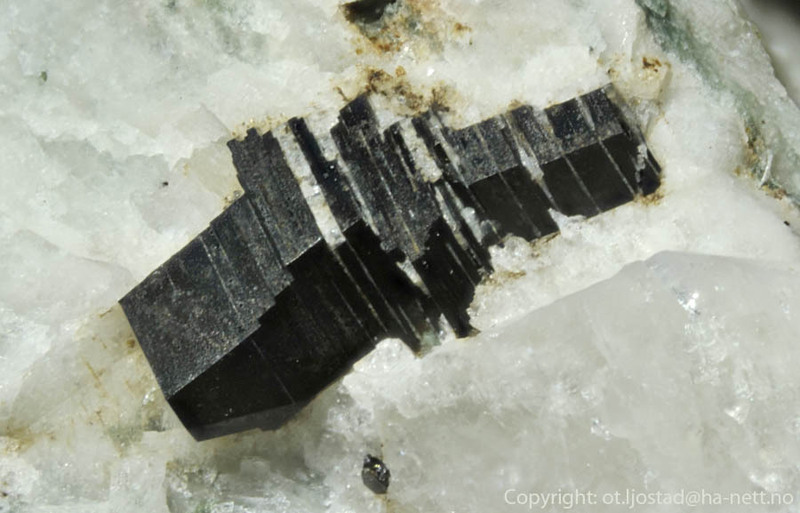 Biotite-Phlogopite Series. The Fe analogue of phlogopite, shirozulite, and hendricksite. 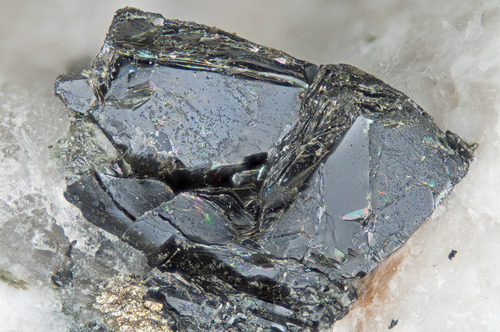 The Al analogue of tetraferriannite. The hydroxyl analogue of fluorannite. Orientation: Y=b; measured 2V according to the Handbook of Mineralogy is from 0 to 5 deg. Sodalite 15 photos of Annite associated with Sodalite on mindat.org. Feldspar Group 12 photos of Annite associated with Feldspar Group on mindat.org. Cancrinite 10 photos of Annite associated with Cancrinite on mindat.org. Nepheline 7 photos of Annite associated with Nepheline on mindat.org. Microcline 6 photos of Annite associated with Microcline on mindat.org. Zircon 5 photos of Annite associated with Zircon on mindat.org. Calcite 5 photos of Annite associated with Calcite on mindat.org. Gagarinite-(Y) 4 photos of Annite associated with Gagarinite-(Y) on mindat.org. Albite 4 photos of Annite associated with Albite on mindat.org. Ferri-nybøite 3 photos of Annite associated with Ferri-nybøite on mindat.org. 16.18.1 Nontronite Na0.3Fe2((Si,Al)4O10)(OH)2 · nH2O Mon. Dana, J.D., Brush, G.J. (1868) 291. Annite. in: A System of Mineralogy, Fifth Edition, John Wiley and Sons, New York, 308-308. Hazen, R.M., Burnham, C.W. (1973) The crystal structure of one-layer phlogopite and annite. American Mineralogist: 58: 889-900. Kwak, T.A.P. (1981) Sector–zoned annite85phlogopite15 micas from the Mt. Lindsay Sn—W—F(—Be) deposit, Tasmania, Australia. The Canadian Mineralogist: 19: 643-650. Tlili, A., Smith, D.C., Beny, J.M., Boyer, H. (1989) A Raman microprobe study of natural micas. Mineralogical Magazine: 53: 165-179. Ertl, A., Schuster, R., Hughes, J.M., Ludwig, T., Meyer, H.-P., Finger, F., Dyar, M.D., Ruschel, K., Rossman, G.R., Klötzli, U., Brandstätter, F., Lengauer, C.L., Tillmanns, E. (2012): Li-bearing tourmalines in Variscan granitic pegmatites from the Moldanubian nappes, Lower Austria. European Journal of Mineralogy, 24, 695-715. Kolitsch, U. (2018): 2090) Annit, Chamosit, Helvin und Ranciéit vom Tannenfeld (Tannfeld) bei Maigen im Waldviertel, Niederösterreich. P. 229 in Walter, F. et al. (2018): Neue Mineralfunde aus Österreich LXVII. Carinthia II, 208./128., 185-254. Horbe, M. A., Horbe, A. C., Costi, H. T., & Teixeira, J. T. (1991). Geochemical characteristics of cryolite-tin-bearing granites from the Pitinga mine, northwestern Brazil—a review. Journal of Geochemical Exploration, 40(1), 227-249. Sheard, E.R. (2010); Williams-Jones, A.E., Heiligmann, M., Sheard, E., Macwilliam, K., Pedersen, C.J., Mercer, W., and Trueman, D (2010) The Nechalacho Heavy Rare Earth And Rare Metal Deposit, Thor Lake, Northwest Territories, Canada. Geological Society of America Abstracts with Programs, Vol. 42, No. 5, p. 335; SHEARD, E.R., WILLIAMS-JONES, A.E., HEILIGMANN, M., PEDERSON, C. AND TRUEMAN, D.L. (2012) Controls on the concentration of zirconium, niobium, and the rare earth elements in the Thor Lake rare metal deposit, Northwest Territories, Canada. Economic Geology, 107(1), 81-104. Lalonde, A.E. and Chao, G.Y. 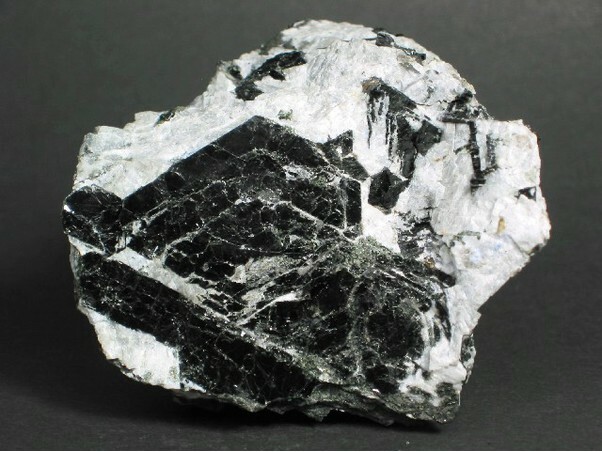 (1997), Annite, biotite and siderophyllite from Mont Saint-Hilaire, Quebec. Rochester Mineralogical Symposium, 187. Chen Diyun, Zhang Bangtong, Sun Dazhong, and Yang Dongsheng (1997): Acta Petrologica Sinica 13(1), 71-84. Yaohui Jiang, Hongfei Ling, Shaoyong Jiang, Honghai Fan, Weizhou Shen, and Pei Ni (2005): Journal of Petrology 46(6), 1-34. Breiter, Karel, Copjakova, Renata, and Skoda, Radek, 2009, The Involvement of F, CO2, and As in the Alteration of Zr-Th-REE-bearing Accessory Minerals in the Hora Svaté Kateřiny A-type Granite, Czech Republic, Canadian Mineralogist, v. 47, p. 1375-1398. Hodson, M.E., and Finch, A.A. (1997): Contributions to Mineralogy and Petrology 127, 46-56.
:	C. Lemanski, Jr. (re-entry of lost Mindat data). K. Török, Eur. J. Mineral. , 1996, 8, pp. 917-925. Anantha Iyer, G.V. and Narayanan Kutty, T.R. (1975) Indian Journal of Earth Sciences, 2, #2, 125-141. F. Bakos, A. del Moro, D. Visona, Eur. J. Mineral. , 1990, 2, pp. 373-383. Miyashiro, A. (1958) Journal of the Faculty of Science, Tokyo University, sec.II, 11, 219. Miyashiro, A. (1958) Journal of the Faculty of Science, Tokyo University, sec. II, 1, 219. De Vito et al (2006): Nb-Ti-Ta oxides in the gem-mineralized and "hybrid" Anjanabonoina granitic pegmatite, central Madagascar: A record of magmatic and postmagmatic events. Canadian Mineralogist. 44: 87-103.; De Vito, C., Pezzotta, F., Ferrini, V., and Aurisicchio, C. (2006): Nb-Ti-Ta oxides in the gem-mineralized and "hybrid" Anjanabonoina granitic pegmatite, central Madagascar: A record of magmatic and postmagmatic events. Canadian Mineralogist 44, 87-103.
ⓘ Jahren pegmatite (Jaren pegmatite) ? ⓘ Johs Nilsens Quarry (Johs. Nilsen Vevja Quarry) ? Puziewicz J. 2001: Origin of annite-epidote-ilmenite-muscovite paragenesis in the granulite from Chałupki (Fore-Sudetic Block, SW Poland). Mineralogia Polonica, vol. 32, no 1, 3-14. Men'shikov Yu.P., Khomyakov A.P., Ferraris G. e.a. (2003) Eveslogite, (Ca,K,Na,Sr,Ba)48[(Ti,Nb,Mn,Fe")12(OH)12Si48O144](F,OH,Cl)14, a new mineral from the Khibiny alkaline massif, Kola peninsula, Russia, - Zapiski VMO, 132(1), pp. 59-67 (in Rus.). Jaszczak, J. A., Dimovski, S., Hackney, S. A., Robinson, G. W., Bosio, P., & Gogotsi, Y. (2007). Micro-and nanoscale graphite cones and tubes from Hackman Valley, Kola Peninsula, Russia. The Canadian Mineralogist, 45(2), 379-389. Sharygin, V. V., & Vladykin, N. V. (2014). Mineralogy of cryolite rocks from the Katugin massif, Transbaikalia, Russia. Abstract Book of 30th International Conference on “Ore Potential of Alkaline, Kimberlite and Carbonatite Magmatism,” Antalya, Turkey, 166-168.; Savel’eva, V. B., Bazarova, E. P., Khromova, E. A., & Kanakin, S. V. (2017). Fluorides and Fluorcarbonates in Rocks of the Katugin Complex, Eastern Siberia: Indicators of Geochemical Mineral Formation Conditions. Geology of Ore Deposits, 59(7), 561-574. Ph. D'arco, J. Cotten, Bull. Minéral. , 1985, 108, pp. 153-159. MITCHELL, R.H. & LIFEROVICH, R.P. (2004) Ecandrewsite - zincian pyrophanite from lujavrite. Pilansber alkaline complex, South Africa. Canadian Mineralogist), 42, 1169-1178.
found and analyzed by Aksel Österlöf. Barton, William R. and Carl. E. Goldsmith. (1968), New England Beryllium Investigations. US Bureau Mines Report of Investigations 7070. Schairer, J. F. (1931): The Minerals of Connecticut. State Geological and Natural History Survey, Hartford, Connecticut. Bulletin 51. Betts, John. (1999): The Quarries and Minerals of the Dayton Road District, South Glastonbury, Connecticut. Rocks and Minerals. Volume 74, Number 2. pp. 110-121.
ⓘ Hollister prospects (Hollister Quarry) ? Bastin, Edson S. (1910): Economic Geology Of The Feldspar Deposits Of The United States. United States Geological Survey Bulletin 420, Government Printing Office. Davis, Fred E. and Stefan Nicolescu. (2011): Samarskite Rediscovered at the Spinelli Prospect, Glastonbury, Connecticut. Bulletin of the Peabody Museum of Natural History: 52(1):135-152. Eldridge, Rev. Joseph. (1900), History of Norfolk. Massachusetts Printing Co., Everett, Mass. : 497. Force, Edward. (1990s), unpublished sketch map. Vogt, Wolfgang. (1991), Rediscovering Thomaston Dam. Lapidary Journal: April. Rice, William North and Wilbur Garland Foye. (1927), Guide to the Geology of Middletown, Connecticut, and Vicinity. State Geological and Natural History Survey Bulletin 41. Baston, Edson S. (1910), Economic Geology of the Feldspar Deposits of the United States. United States Geological Survey Bulletin 420. Williams, Horace S. (circa 1945): Article for New York Society of Mineralogists. Brainerd Public Library, Haddam, Connecticut; P. Cristofono collection, 2009. Personally collected by Harold Moritz. Lundgren, Lawrence, Jr. (1963): The Bedrock Geology of the Deep River Quadrangle. State Geological and Natural History Survey of Connecticut. Quadrangle Report No. 13: 19-21. Bastin, Edson S. (1910): Economic Geology of the Feldspar Deposits of the United States. U. S. Geol. Survey Bull. 420. Schooner, Richard. (1955): 90 Minerals from 1 Connecticut Hill. Rocks & Minerals: 30(7-8): 351-8.; Cameron, Eugene N., Larrabee David M., McNair, Andrew H., Page, James T., Stewart, Glenn W., and Shainin, Vincent E. (1954): Pegmatite Investigations 1942-45 New England; USGS Professional Paper 255: 333-338.; Zodac, Peter. (1937): Minerals of the Strickland Quarry. Rocks & Minerals: 12: 131-144. Cameron, Eugene N. and others. (1954) PEGMATITE INVESTIGATIONS 1942-45 NEW ENGLAND. U.S. Geological Survey, Professional Paper 255. Hanson, S., Jarnot, B. M., Falster, A. U., Simmons, W. B., and Nizamoff, J. W., 2003, Nb-Ta-Ti Oxide Minerals from Two Pegmatites of the Middletown Area, Connecticut, Program with Abstracts, v.30, p. 11. King, V. and Foord, E., 1994, Mineralogy of Maine, v.1. Van King; King, V. (ed. ), 2009, Maine feldspar, Families, and Feuds. King, V. T., 2009, Maine Feldspar, Families, and Feuds, book in press. Cheney, J. and Guidotti, C., 1973, American Mineralogist, v. 58, p. 1076-1079. Thompson, W. B., Joyner, D. L., Woodman, R. G., and King, V. T., 1998, A Collector's Guide to Maine Mineral Localities, Maine Geological Survey, Augusta, Maine, pp. 106. King, V. T. and Foord, E. E., 1994, Mineralogy of Maine. Miller, Robert and Wing, Lawrence, 1945, Wallace Trufant Prospect, Bowdoinham, Appendix A, in Trefethen, Joseph, Report of the State Geologist 1943-1944, Maine Development Commission, p. 29. King, Vandall T. and Foord, Eugene E., 2000, Mineralogy of Maine, volume 1 & 2. King, V. and Foord, E., 1994, Mineralogy of Maine, Descriptive Mineralogy, volume 1, Maine Geological Survey, pp. 418 + 88 plates. Merrill, George P. (1889): The Collection of Building and Ornamental Stones in the U.S. National Museum, p. 554. Dana (1868), A System of Mineralogy, 5th edition; Dyar, M. Darby and Burns, Roger G. (1986): Miissbauer spectral study of ferruginous one-layer trioctahedral micas (American Mineralogist, Volume 71, pages 955-965). Personally collected by Kevin Czaja. Cameron, E., et al., 1954, Pegmatite Investigations New England, USGS Prof. Pap. 255. Tracy, Robert J. (1991) Ba-rich Micas from the Franklin Marble, Lime Crest and Sterling Hill, New Jersey, American Mineralogist, v76, p. 1683-1693.
ⓘ Crown Point Spar Company Quarry ? ⓘ Crown Point pegmatite ? ⓘ Werner Prospect 1 ? ⓘ Overlook Quarry (Atlas Feldspar Company Quarry; Atlas Quarry; Day Quarry) ? J.D. Price et al. , Eur. J. Mineral. , 1996, 8, pp. 435-451.